The Spanish Super Cup remains delicately poised after Barcelona secured a 3-2 win against Real Madrid in a pulsating first leg. The match was the first time the two sides had met since Pep Guardiola ended his reign as Barcelona manager and was replaced by assistant Tito Vilanova. 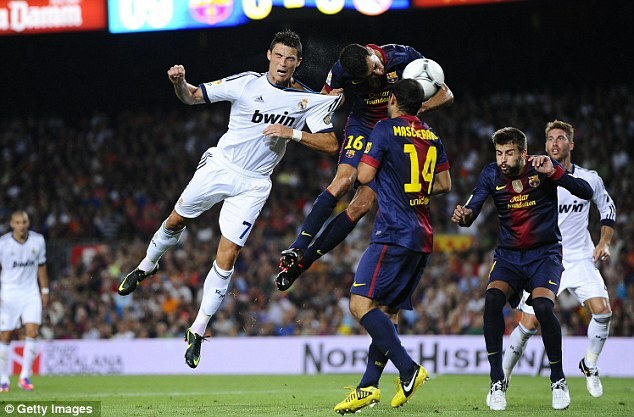 Real's Cristiano Ronaldo first headed in a corner, which Pedro levelled immediately from the kick-off. Lionel Messi scored a penalty after Andres Iniesta was fouled, before Xavi slotted home a sublime third. Angel Di Maria then pounced on keeper Victor Valdes' mistake to breathe life into next Wednesday's second leg. The action then raced from end to end and it was the hosts who forged ahead 20 minutes from time when Lionel Messi scored from the penalty spot after Sergio Ramos had brought down Andres Iniesta. Then a terrific jinking run from Iniesta freed Xavi to stroke home Barcelona's third goal seven minutes later. However, the visitors were gifted a way back into the tie five minutes from time when Barcelona goalkeeper Victor Valdes tried to dribble around Angel Di Maria and only succeeded in gifting the Argentinian an open goal. Barcelona were deserving of the victory but may rue not taking full advantage after dominating for large spells against a Real side who failed to find the cohesion that had seen them go unbeaten in three of their last four trips to the Nou Camp. However, for all their dominance Barcelona only had another two long-range efforts on goal as Pedro's drive was tipped over by Iker Casillas before Xavi shot just over from similar range. And it was the visitors who took the lead 10 minutes into the second period as Ozil's corner was bulleted in by Ronaldo for his fourth goal in his last four away games against Barcelona. The lead lasted less than a minute as a wonderful ball over the top from Javier Mascherano found Pedro in behind Fabio Coentrao and the Spanish international slotted past Casillas. The game then became increasingly stretched as both sides tired slightly from playing in the still searing heat, despite the late kick-off time, and the visitors' luck with Gomez eventually ran out as Iniesta was brought down inside the area by Ramos and Messi stepped up to thunder home the penalty. Moments later Iniesta showed incredible speed of foot to dance past three Real challenges and slip a pass through for Xavi to sidefoot past Casillas. And within seconds the complexion of the tie had completely changed as Valdes' error allowed Di Maria to give Madrid a lifeline heading into the return at the Bernabeu next Wednesday.